Start off your visit on the 24th (Sun): explore the world behind art at Musée Fabre, then see the interesting displays at Le Pavillon Populaire, then do a tasting at Xavier Vins, and finally take in the architecture and atmosphere at Cathedrale de Maguelone. To find more things to do, reviews, other places to visit, and other tourist information, read Montpellier itinerary planner. July in Montpellier sees daily highs of 34°C and lows of 22°C at night. Finish up your sightseeing early on the 24th (Sun) so you can catch the train to Beziers. Béziers is a town in Languedoc in southern France. On the 25th (Mon), steep yourself in history at Enserune Archaeological Site, then discover the deep blue sea with a scuba or snorkeling tour, then learn about winemaking at Domaine des Deux Ruisseaux, and finally take in the architecture and atmosphere at Eglise de la Madeleine. For traveler tips, reviews, ratings, and more tourist information, go to the Beziers travel planner. You can take a train from Montpellier to Beziers in an hour. Another option is to drive. In July in Beziers, expect temperatures between 34°C during the day and 22°C at night. Cap off your sightseeing on the 25th (Mon) early enough to catch the train to Narbonne. The Mediterranean city of Narbonne links to the nearby Canal du Midi and the Aude River by the Canal de la Robine, which runs through the center of town. Kick off your visit on the 26th (Tue): take in the architecture and atmosphere at Notre-Dame-des-Auzils, step off the mainland to explore Ile Sainte-Lucie, then don't miss a visit to Tour Barberousse, and finally steep yourself in history at Donjon Gilles Aycelin. To find photos, more things to do, and more tourist information, refer to the Narbonne tour planner. Narbonne is very close to Beziers. In July, daytime highs in Narbonne are 34°C, while nighttime lows are 22°C. Finish your sightseeing early on the 26th (Tue) so you can take a train to Carcassonne. Start off your visit on the 27th (Wed): do a tasting at O'Vineyards, then explore the activities along Lac de la Cavayere, and then get to know the fascinating history of Carcassonne Medieval City. 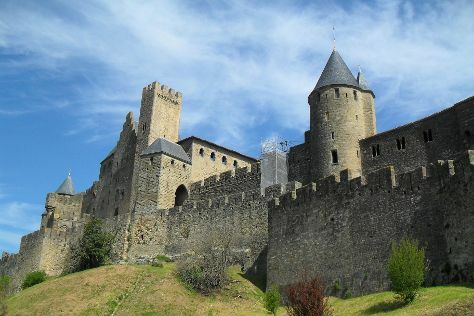 To see other places to visit, traveler tips, more things to do, and tourist information, read our Carcassonne travel planner. Carcassonne is very close to Narbonne. In July, daily temperatures in Carcassonne can reach 33°C, while at night they dip to 20°C. Finish your sightseeing early on the 27th (Wed) so you can travel to Villespassans. Do some cultural sightseeing at Domaine de l'Herbe Sainte and Chateau Guery. Explore hidden gems such as AVENTURE 34 / Nature & Loisirs sportifs and Gorges d'Heric. Explore the numerous day-trip ideas around Villespassans: Fort Saint-Jean d'Alcas (in Saint-Jean d'Alcas) and Kayaking & Canoeing (in Roquebrun). There's still lots to do: do a tasting at Chateau de Combebelle and make a trip to Le site cathare de Minerve. To see more things to do, photos, and more tourist information, go to the Villespassans trip itinerary builder. The Route module can help you plan travel from Carcassonne to Villespassans. In July, daily temperatures in Villespassans can reach 34°C, while at night they dip to 22°C.